The Sun EZ-3 USX is a human-powered, recumbent, three wheeled vehicle. It engages me in a way that the Segway did not. I am amazed this product, what some call a “bent trike,” is not better known. What’s significant about the USX? It’s the most comfortable human powered vehicle ever, more comfortable than many cars. It’s safe, practical, and affordable. I hate exercise but I find myself impatient to get my next chance to ride this thing. The USX is potentially a major step forward in promoting conservation and healthy exercise in America. Riding the USX is eerie, because it feels like relaxing on a perfect easy chair and performing aerobic exercise at once. You can go fast or slow, and both are wonderful. You can load the thing with 400 total pounds. You can pull carts. Some riders have decked out USX’s with ipod sound systems and other amenities. There are some downsides. It’s heavy: 65 pounds. Going up hills is pleasant, but slower than on a bicycle. Another big plus: you sit high enough to be noticed by car drivers, though I also added a flag and extra lights to err on the side of caution. Although it looks wide, and encourages cars to give more room than is commanded by bicyclists, it is actually narrow enough to roll through a standard door. You can stand it up on end so it takes minimal room when parked. You can just stop and rest while going up hill- it has a parking brake. ICE, HP Velotechnik and , Catrike. I have tried some of them, and I think they are fun and interesting, but not what I want. Some of them are expensive, very low slung (you’re practically on the ground while riding), and not so practical for non-atheletes. What I want is something that’s super easy to get in and out of, that’s fun to sit on while standing still, that’s high up enough to be safe around cars, and that is fun to ride slow. I want something for life, not for sport, and there’s not much competition in this niche. There is another interesting comfort-oriented bent trike, the Hase Leupus, from Germany. Beware that sometimes enthusiast cults get lost in fantasy. The enthusiasm in the bent trike world sometimes reminds me of what happened with high-end consumer audio. Superstitions crowded out reality. People started to spend insane money on audio cables with impossible physical properties. Even though the USX is ridiculed by some hard-core bent bike enthusiasts, it is an important product, even aside from the low price. I just was given this trike and I love it. I need to accessorize it now.Any good places to check into? The derailleurs are different. The quality level on the Stowaway is a bit better and you can feel the difference. Thank you for the deal information on the Sun EZ-3 USX HD Trike. I am currently looking to purchase a trick in the very near future and this information was especially helpful. This one is definitely moving to the top of my list. Test ride it. But beware that first impressions change. I bought one for my wife because it was the only delta trike that would work for her and we have a friend who owns three and loves it. My wife is just getting back into exercise and bike riding after some health problems and it was no contest as two which trike to purchase. Now, I have become enamored with delta trikes for a number of reasons. But, I desire one that is more performance based. I have ridden this trike for 132 miles now. My first ride was up the road I live next to which is about a 4% gradient. I tried to ride it like I would be bicycle powering up the hill. The front wheel felt light and the trike pulled to the left on each pedal stroke. I didn’t like it. However, as I rode it more, I realized that “powering” it up the hill is not how to ride it. I now downshift and spin at a higher cadence and I notice no wheel hop and no pulling to the left. It was just learning how to ride it. The more I ride it, the more I like it. The reality is that it is 65 lbs, but the gearing goes low enough that I can easily climb up to about 9% gradient (I haven’t tried steeper). This is a great utility trike for everyday riding and casual cycling with social groups. It is not, however, a performance trike. It is just too heavy and the gearing is too low. For a performance trike of the delta style, the Hase Kettwiesel or Green Speed Anura is the way to go – if you can afford to pay more than twice as much as the Sun. How much is it??? DON’T hide the price! It’s a putoff for the brand and I’m not buying. The USX HD does not fold. 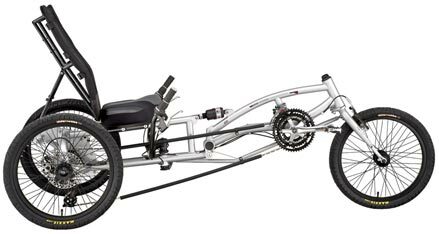 If you need folding look at a tadpole style of trike from ICE, Hp Velotechnik, Trident, Tw-Bents, Catrike all have folding trikes.